I try to alternate my beauty products from my UK based (weather appropriate aka cold and windy) essentials to my hot climate essentials when on holiday. Think lighter bases, warmer tones, and travel friendly packaging. Lets start with tools. When you're hot and sticky, there's nothing better than a cold (really cold, run the tap for a while) sponge to buff your foundation in. I use this for my foundation as well as concealer as it gives a not too full coverage but is totally buildable depending on your skins needs. The combination of these two give the most beautiful dewy finish, without feeling too heavy on the face. 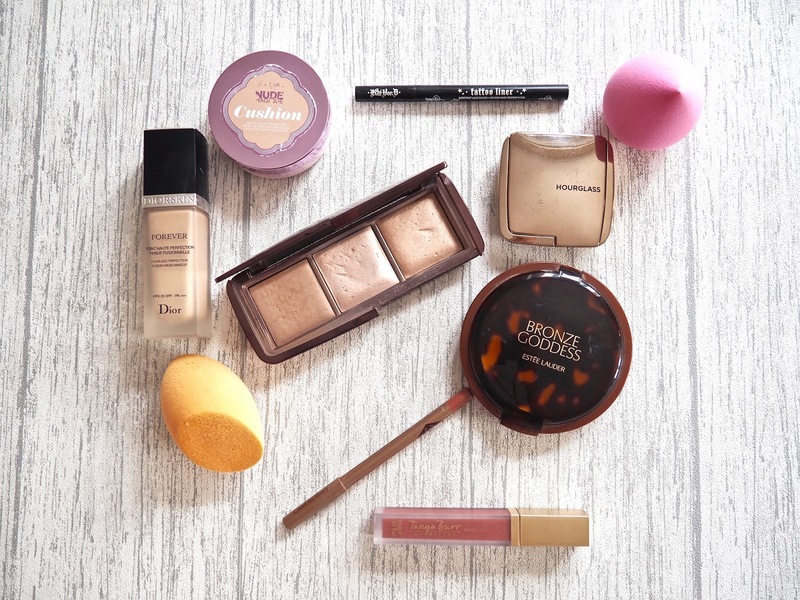 I start with the Dior skin foundation, buffed in with my beauty blender. My current shade is slightly too light for me with a tan, so I also put a little bit of Benefit Hula Liquid bronzer into it if that is the case. After, I lightly tap on some of the cushion foundation. I find this is a lot more dewy and glowy looking than the Dior and is light enough to add this on top. To add a dewy glow I also use this to contour my cheeks and nose slightly. Its nothing too dramatic and can also be easily applied with the beauty blender. There is nothing more beautiful (in my opinion) than the Hourglass highlight in 'Incandescent'. I have it in the ambient lighting palette and I use it every day (winter or summer). Alternatively, you could keep it quite subtle and use the Loreal Lumi Maqigue highlighting pen, which is a great dupe for theYSL Touch Éclat and sticks with the creamy fomulas of the foundation & bronzer. Think anything waterproof. There is nothing worse than developing panda eyes throughout the day because you haven't come prepared with waterproof mascara. That, and my life saver for small eyes- Kat Von D Tattoo Eyeliner. It isn't technically waterproof but is pretty much guaranteed not to budge throughout the day! No makeup face is complete without a good spritz of setting spray. Especially in a hot climate! The bottle for one is so pretty, and the product inside doesn't disappoint. I also try to keep this in my handbag too when exploring, as it doubles up as a lovely refreshing mist on the go. What are your summer skin favourites? As much as I love a makeup free pool lounging session, I also love feeling extra confident on holiday, and for me a bit of light makeup does just the trick.